"This is a creative work by TimeYard." >>> About TimeYard: TimeYard is a brand committed to Handmade Woven for bringing fresh and lifeful atmosphere to your home. Besides the ingenuity of the designer and the niceness for materials, keeping improving for the handicraft of Handmade Woven attracts people mostly. All designs are handmade with love and will bring a unique element into any space. Multipurpose macrame hanger in 100% cotton, with round beech wood platter. You can place (nearly) anything you like on this piece, so choose your most beautiful plant, candles, ceramics, or flowers to create a dreamy bohemian space in any room in your house! - Diameter wooden platter: 30cm / 12"
- Length from top to bottom of the platter: about 90cm / 35"
- Package include: 1 x Macrame Planter Hanger; 1 x Wooden Plate, Well Packed in Box. * Please note that cotton is a naturally flexible material, which may cause the cotton hangers to lengthen slightly over time. Beautiful macrame shelf made of twisted cotton cord decorated with raw wooden beads, and oiled chestnut wooden base with 2.3cm deep side protection, strong and durable. The props are not included in the offer. Hung off a hook on the wall or ceiling, this versatile macrame floating shelf is ideal for display your beloved cactus, succulents, small herbs, flowers or store small decor to create a dreamy bohemian space in any room. 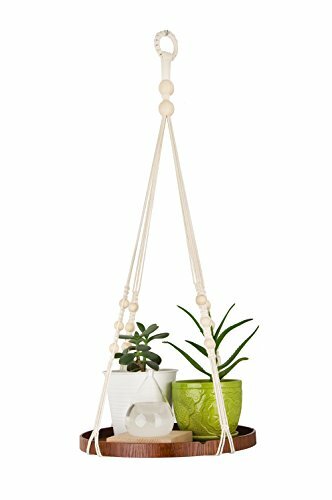 Since this macrame hanger set can hang from the ceiling, you save on shelf space and can beautify any indoor / outdoor corner spaces. This beautiful and unique hanging art makes a wonderful gift for housewarmings, weddings, and all occasions. Inspired by tribal objects, ethnic art, aztec decor and boho decor, macrame is an ancient form of textile produced using knotting. It's one of the oldest crafts and it needs patience and time to finish. All our macrame plant hangers are handmade by our local artisans, with love and peace. Size: This macrame hanging is approximately 35" in height, wooden shelf is about 12" x 12" x 0.9". This is a creative work by TimeYard. TimeYard has come to be known as a trusted brand that behind 100% of its products, attention to detail is always our priority and each of our pieces is made with meditative focus, joy in the creative process, and gratitude. We welcome all product questions with customer support available 24/7. If you have any questions about this product by TIMEYARD, contact us by completing and submitting the form below. If you are looking for a specif part number, please include it with your message.